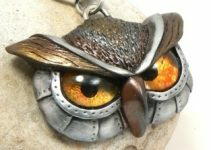 Desert Rubble is home to the original industrial scrap pendants! 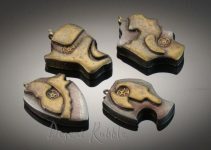 Starting with that first set of 4, I set a tone and feel for these pendants that are unmistakable. 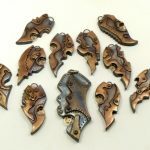 These pendants are handcrafted from polymer clay but they might have been pieces of found metal scrap and hardware in some post-industrial world that was then made into jewelry. Ever drawn to all things post apocalyptic, I love the aura I create with the colors, metallics, and haphazard pieces of faux hardware. 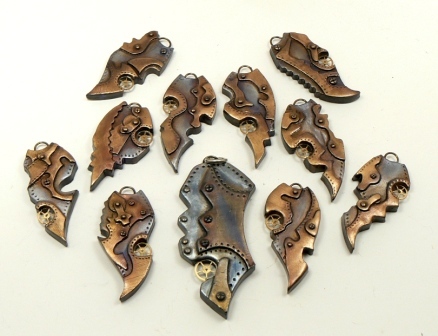 Recently I handcrafted a new batch of industrial scrap pendants and photographed them with one of those first pendants. 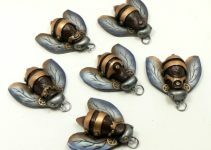 That early piece was featured on the front page of the April 2011 Polymer Cafe where you can also find a tutorial to make it. It was surprising to me the difference between that first one and the new ones. I always hope I’m getting more skilled and can get better detail on a smaller scale than when I first started but it sure is nice to have confirmation of that. These new ones are smaller, thinner, remarkably light, they’re actually fun to handle because of it, is that weird? I just really love them and think they came out great…..and I’ll share a secret, I actually had to look through that tutorial I made to remember how I got the color combination on those first ones, funny right? I see so many advantages to making tutorials of my work!